A diver named Rodrigo Friscione Wyssmann was exploring with his father off the coast of Mexico when they happened upon a heartbreaking scene. There, dangling listlessly in the warm waters of the Pacific, was a mother whale who had recently lost her calf in a predator attack. Swimming nearby was a male companion, who seemed unable to stir the mother whale from her paralyzing grief. "When we got there, the mother was inconsolable. The male was trying to comfort her by touching her gently, but it was useless," Wyssmann wrote on Facebook. "Some of you may already know this, but it's only the male whales who sing (while mating), so this was obviously a devastating and silent moment." For almost a week, the mourning mother and her companion lingered near the site where her calf was killed, Earth Touch News reports. Having witnessed what appeared to be such profound sadness, the haunting scene has been hard for Wyssmann to shake as well. 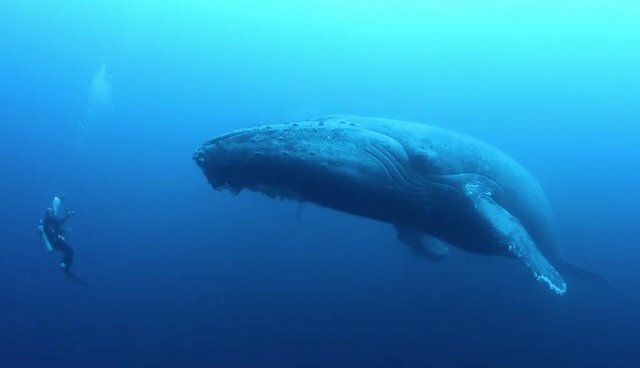 "I still dream with this silent encounter with the humpback whales," he wrote online, where another clip from the encounter was posted. "There is no doubt that many animals experience rich and deep emotions. It's not a matter of if emotions have evolved in animals but why they have evolved as they have. We must never forget that our emotions are the gifts of our ancestors, our animal kin. We have feelings and so do other animals."